Never practiced yoga before? This 6 week workshop series is designed specifically for the absolute beginner or anyone wanting a step-by-step review of the basics. In just 6 short weeks, you will walk away with a strong foundation in the fundamentals of yoga, breathing, and alignment. Upon completion you will have enough knowledge to be comfortable walking into any Drop-in Hatha or Open level yoga classes. Families require intentional commitment to relational growth and a good helping of fun. Family yoga classes will aim to provide an environment where children and caregivers can learn the fundamentals of being kind: to one’s self, to others and to the earth. Each class will grant families the opportunity to foster connection, find moments of quiet and learn to seek contentment in the day to day family experience. Through story-based yoga flow, families will go on journeys that will teach basic yoga poses and reinforce a peace-filled lifestyle. While silence is a seldom found virtue in a busy family’s experience, family yoga will be a meditation made up of giggles and positive words and touch. Recommended for families with kids aged 4/5years - 9/10years. If registering online, please remember to register yourself and all other members of your family. Increasing studies are revealing that Nature has a calming effect onthe mind and body which is a key factor in having a healthy birth and a healthy child. Set in a quiet greenhouse amongst farmers fields, pregnant women will be guided through a series of yoga classes specifically designed to help prepare their mind and bodies for their upcoming birth.Expectant mothers can enjoy a relaxing yoga class in this serene setting while connecting with other moms and building a newfound community. Classes are open to all levels of yogis as poses can be modified depending on the mothers pregnancy, past yoga experience, and which trimester they're in. Students move in and out of poses with their breath like a dance. Poses will improve strength, flexibility and balance. Flow yoga is more energized and provides students with a stronger workout. In just 6 short weeks, you will walk away with a strong foundation in the fundamentals of Vinyasa Flow Yoga, and upon completion will be capable of entering any Flow or open level yoga class. It is recommended students attend some Hatha classes prior to attending this workshop series. 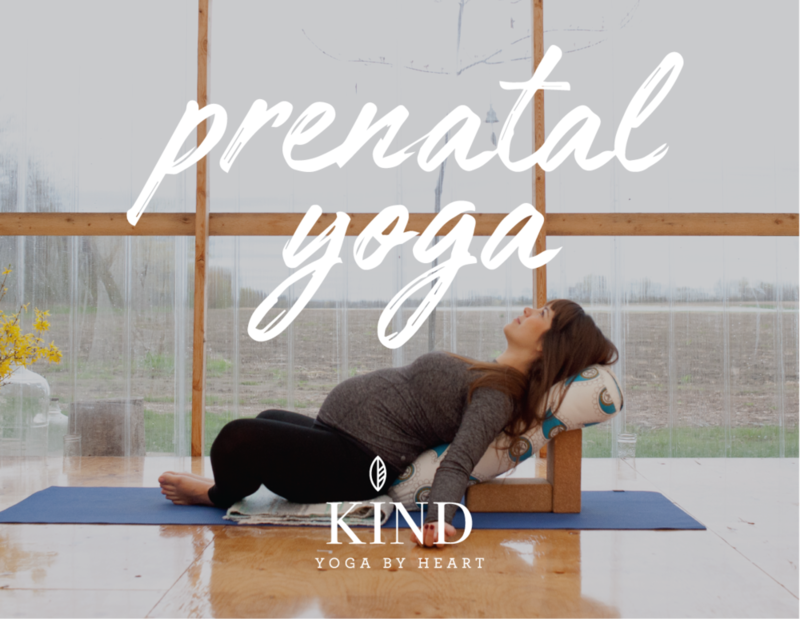 KIND is offering a 6 week Mommy and Me yoga series set outside in our peaceful greenhouse amidst gorgeous farmers fields. We invite you to come with your wee one and enjoy classes that will incorporate snuggles, cuddles and a good sweat. This series is a perfect way for moms to get back on the mat as each class is a shortened 45 minutes. Mom's can practice completely guilt free as we understand your infant will likely disrupt the class, and we're perfectly fine with it! This is an all levels series and will be the perfect way to bond with baby, nurture your body and connect with other mamas in the community. **Ideal for Mom's with infants 5 weeks - pre crawling. * Child must be able to hold their head up on their own. Please be reminded that all pre-registered classes require a minimum number of participants in order to run. If the course is cancelled, all who pre-paid online will receive a full refund or full studio credit. • If one weeks notice is provided, you will receive a full studio credit towards other classes or courses at our studio OR a refund less a $50.00 late cancellation fee. • Within 6 days before the start date, you will receive full studio credit to be used towards all classes and courses. • Notice within 48 hours or less before the start date, you will receive 50% studio credit, and no-shows will receive no studio credit or refund. If you happen to miss a class, don’t fret, you are allowed one make-up session that is valid at any of our drop-in classes or other courses within the studio. Please keep in mind that make-up classes must be redeemed within a month after the course ends. If a class is cancelled due to weather or unforeseen reasons, the studio will be sure to add another make-up class to each student or the equivalent of a make-up class in studio credit.